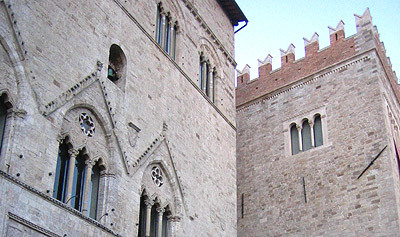 Todi is a fundamental stage of every trip in Umbria. The city distinguished itself for its unique and evocative beauty. Its origin dates back to the 7-8 century before Christ, when with the name of Tutere it marked the border of Etruscan lands. Todi keeps intact one of the most beautiful public square of Italy: Piazza del Popolo, with its buildings of rare beauty like the Palazzo del Popolo (1214-1218), Palazzo dei Priori and Palazzo del Capitano (1290). The last hosts now the Museum which keeps a work by Perugino's school. Piazza del Popolo also is the way to the underground Todi where it's possible to admire the Cisterne Romane (I sec. a.C.), water system of the ancient city. The city is protected by a double town-walls (Etruscan and medieval) and it's a labirinth.